Approximately 90km WSW of the Pitcairn Islands a number of submarine volcanoes have been discovered on the over-30-million-year-old Pacific Ocean crust, at around 25 degrees 10’S, 129 degrees 20’W. Also known as Seamounts or Hotspots, the three largest are 1,500 – 3,000M in height and have been given the names Adams, Bounty and Christian. More than 100 submarine volcanoes exist with 20 small volcanic hills or eruptive vents reaching 500M in height. These have been located within the area of study which has a radius of 110km, with Bounty and Adams being 25km apart. Formed by successive eruptions of lava, the volcanoes have proved of immense interest to scientists and geologists, as well as to the people of Pitcairn with the largest hotspot, Adams, rising to 3,500M and coming within 39M of the surface. The Bounty seamount rises to within 450M of the surface and appears morphologically more youthful (350,000 years) than Adams with water samples indicating continuing hydrothermal activity. The French company Ifremer, have used two dedicated ships R.V. L’Atalante and R.V. Nadir and recently completed 15 dives with the submersible Nautile making observations and sampling volcanic structures on the ancient ocean crust of the Farallon Plate, at depths of 3,500 – 4,300M. Their work uncovered evidence that the seamounts were formed by successive eruptions of highly vesicular, alkaline lava flows. Evidence of lava tubes, hydrothermal springs, trachytic lava flows and deposits of iron silicide hydroxides (on Bounty’s peak), have also been found. 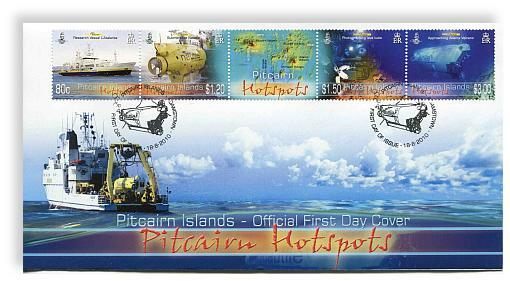 The Pitcairn Islands Philatelic Bureau is grateful for the assistance provided by Dr Roger Hekinian, co-author with Dr Peter Stoffers and Dr Jean-Louis Cheminée of the book “Oceanic Hotspots’, (Springer-Verlag Berlin Heidelberg, 2004) and Daniele Lemercier of Ifremer in Paris who provided the images used. Ifremer worked with the University of Kiel in Germany on the Pitcairn seamounts project.